I handcrafted this piece of art, one of a kind Hnefatafl board using pine wood and deer antlers. Crafting the board much like I do my Viking House/Rune Shields. The board is a piece of solid 1x10.25” laminated pine. Each playing piece is made from semi-precious stones. The King is a piece of carnelian. The King’s Men are real turquoise. The opponent pieces are real jade. 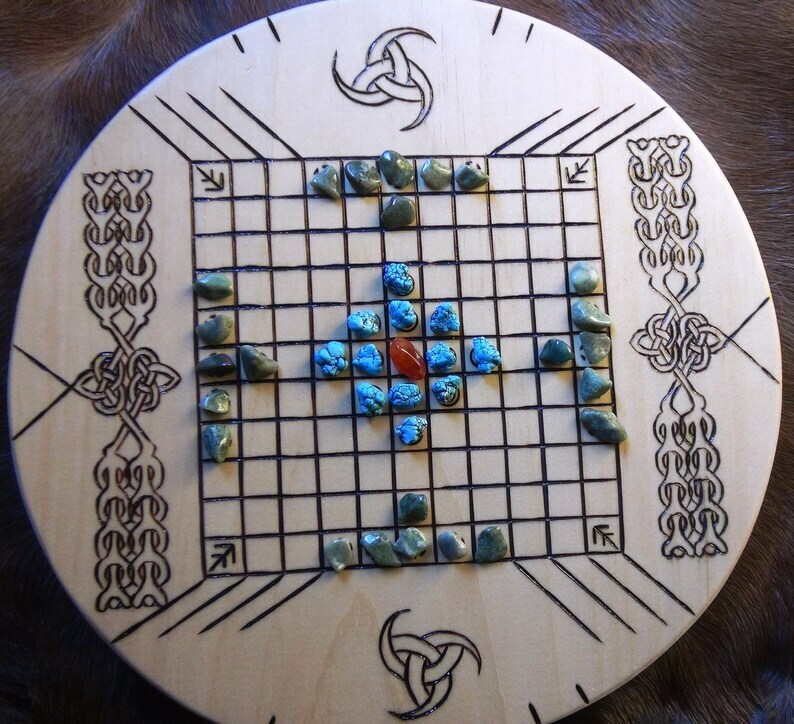 The playing board is wood burned and contains the 120 square battlefield. Burned into the top and bottom are Odhinn's Horns. The sides have a decorative burned set of knots. The King's 5 Spaces have the bind rune for divine energy. The name of the game, Hnefatafl is burned into the back of the playing board. The board is treated with clear water-based polyurethane.